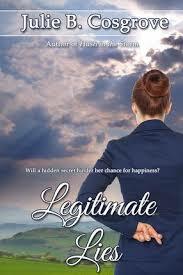 Legitimate Lies is the sequel to Hush in the Storm by suspense author and abolitionist activist Julie B. Cosgrove. She has a unique story to tell that pulls you into the web of deceit and treachery of the human slave trade that takes place around the world. While Hush is centered in the United States, this book takes the reader to Great Britain because this is an international problem. Suspense is paramount as Jen’s cover in Witness Protection is blown by the Tom, the man she loves. She is whisked away to Great Britain to undertake a new identity. When her smooth talking criminal husband hunts her and kidnapps her, she fights to hold on to truth in the web of lies keeping her prisoner. Can she escape? And where is Tom? Will he find her? Is there any hope they could be free from the lies, free from her marriage to a criminal mastermind and free from the sins of her past? Only God can lead the way to that as well as providing perhaps healing and hope for others caught in her husband’s web of slavery. This book is hard to put down. Fast paced and filled with action and drama as well as heart-rending romance, it is sure to satisfy any reader while drawing attention to the very real evils that are currently at play in our world.